Le Bourget, Paris – 04 December 2015: The Philippines convened today an extraordinary ministerial session of the Climate Vulnerable Forum (CVF) in reaction to the collapse of the Review of the 2 degrees Long-Term Goal under the Convention, which held its final session last night at the UN Climate Change Conference in Paris (COP21). 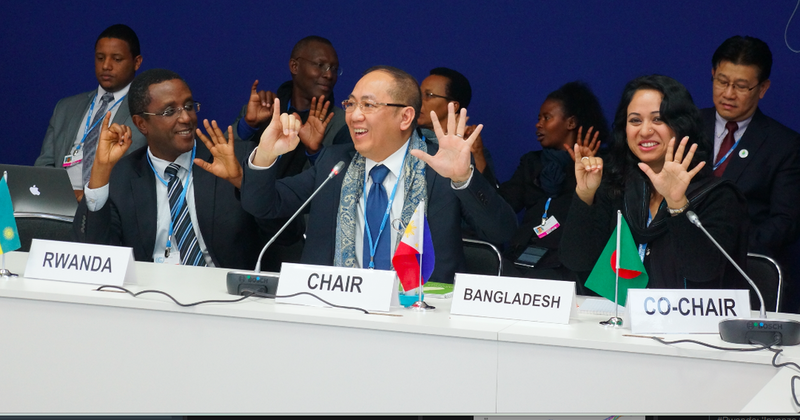 “Our resolve has become even stronger after this meeting,” said Emmanuel M. de Guzman, Climate Change Commission head and chief of the Philippine Delegation to the UNFCCC. “The movement for a safe future is unstoppable. Countries denying science and reason will have to face the growing number of countries and citizens calling for the 1.5 degree target to be reflected in the Paris agreement,” he added. The failure of the 2013-2015 Review to forward for decision any results of the unprecedented three-year international technical review process contrasted against the continued increase of support for the 1.5C goal. The CVF, led by the Philippines, recognized four additional 1.5C supporters today: Chile, Colombia, Paraguay and Peru, of the AILAC group, an independent alliance of Latin American countries in the negotiations. The CVF’s #1o5C campaign site increased the number of UN member states explicitly supporting 1.5C to 112 nations. Momentum for other states to declare support for the more ambitious temperature target was felt throughout the conference today with eruptions of spontaneous 1.5C actions from civil society and youth groups. The Forum also inducted new members over and above the group of 43 nations already associated with the initiative.